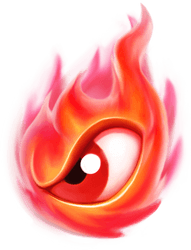 Dragon Fury is a special attack in combat which deals a high amount of damage to all opposing Dragons. The damage dealt is based on the Trainer's Dragons and also depends on how many times the opponents are hit during the attack. Dragon Fury multiplies the sum of all Dragons' base damage by two. If a Dragon is defeated before the Trainer activated this feature, its base damage is still added to the Dragon Fury. There are two ways to perform these hits once the fury is unleashed: swiping or repeatedly tapping/clicking over the enemy Dragons. When unleashed, Dragon Fury also awards 2,000 points to the overall battle score for a maximum of 4,000 additional points. It can be used in any battle involving Dragons, excluding those in the Enchantment League. A minimum of 55 hits is needed to achieve maximum damage. Dragon Fury can be used only once per turn, but there is no limit to how many times it can be used during a fight. Once Dragon Fury is initiated, the Trainer has approximately 5 seconds to use it. After Dragon Fury is used, the number of hits the Trainer managed to achieve will be shown at the end. The more hits a Trainer does, the bigger the font of the text will be. In addition to the number of hits, a one-word "description", which changes depending on the number of hits, will also be shown on the screen. Cool is given to hits between 1 and 14, superb to hits between 15 and 29, and unbelievable to 30 or more hits. If the Trainer uses Dragon Fury against multiple opponents, the total damage is split between the opposing Dragons according to the percentage of hits the Dragon took (see Example 3). Dragon Fury Attack = 2 * Sum of Attack Power * (Number of hits/55)^0.7. Seven perfect hits are required to fill the Dragon Fury bar in order for it to be used. That means the hits have to land in the green section of the power bar in order for one point to be earned. The only exception to this is when battling in the tutorial, as the Dragon Fury bar will be filled and ready to be unleashed after two perfect hits. Alternatively, the Dragon Fury can be used without charging it in exchange for Gems. The cost will slowly lower as the bar charges. Dragon Fury Essence allows the Dragon Fury bar to be immediately refilled without paying Gems. Once obtained, bottles of Dragon Fury Essence are held in the inventory until used. Daily Prizes - Between one and three bottles can be given as part of the Daily Prize items. Totem of Friendship - One bottle is given as the second achievement reward for collecting 350 points. Dragon League - One bottle is won for achieving a win streak of 15 and 2 bottles are won for achieving a win streak of 20. 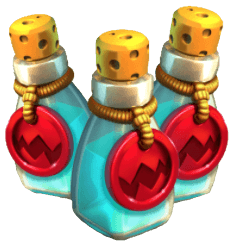 Level-Up Rewards - One bottle can be awarded randomly upon earning the necessary experience, if the user is at maximum level. Otto's Lotto - One bottle can be won from playing the lotto. Events - Can be awarded as prizes in events, particularly in Calendar Events. Whale-Mart - Can be given as an offer or a part of an offer in the Whale-Mart. Bundles - Can be offered as part of a promotion in the Main Shop. Additionally, Gameloft will, occasionally, give free bottles to Trainers, usually to celebrate a game-related milestone. When the game was first introduced, Crimson Fury could be purchased at the shop in exchange for real currency so as to begin each battle with a fully charged Dragon Fury. It can be used for an unlimited number of fights, but only once per fight. Update 3.7 introduced the Whale-Mart along with the possibility of obtaining Dragon Fury Essence through this feature. Update 3.0 removed the in-game technical maximum damage limit of 2,147,483,647. Update 1.5 introduced Dragon Fury Essence. At some point in the game, in the first version (Version 1.0), the purchase of Crimson Fury was discontinued. Those who bought it before this discontinuation are still able to use it. Its price was 4.99 USD, but sometimes discounted to 1.99 USD. This page was last edited on 29 January 2019, at 05:47.